J. W. Modelski received his M.Sc. (’73), Ph.D.(’78), and D.Sc. (’87)-habilitation degrees in electronics from the Warsaw University of Technology (WUT), and state title of Professor in 1994. In 2011 he received title of doctor honoris causa from the Military Technical Academy. Since 1973 he has been with the Institute of Radioelectronics WUT, holding in sequence all academic positions from teaching/research assistant to tenured professor (1991), and since 1996 has been its director. In 1976/77 he spent over a year in the US as a Fulbright grantee working with the microwave laboratories at the Texas University (Austin), Cornell University (Ithaca) and COMSAT (Clarksburg). In 1985 he visited Germany as a DAAD grantee and in 1986 he joined for 2 years the Braunschweig Technical University (Germany) as a senior scientist. His research interests include the area of: microwave modulators and shifters, dielectric resonators and their applications, integrating waveguide technology and smart antennas. He has published over 300 technical papers, 4 monographs, obtained 9 patents and was supervisor over 20 Ph.D. dissertations. 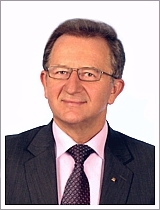 Since 2007 he has been a Member of the Polish Academy of Sciences and Chair of the Committee of Electronics and Telecommunications. Since 2000 has been IEEE Fellow, in 2008 was President of the IEEE Microwave Theory and Techniques Society, in 2009-2010 IEEE Region 8 Director, currently is IEEE Division IV Director-Elect. He has been active in URSI National Committee since 1973.